You may have noticed that for a while, I've had a badge on the right side column stating "I Choose Authenticity"
Well, what does this mean? I have always tried to be real on this blog. It makes some people uncomfortable and I've been told by a few people that I shouldn't be as open as I am. For a while I've been keeping myself in check. Holding myself back has, no kidding, physically hurt. It's not me! YES, I love participating in beading challenges and YES I like to show my jewelry and Etsy finds and Zack hilarity, but I also find immense relief in writing from the heart. 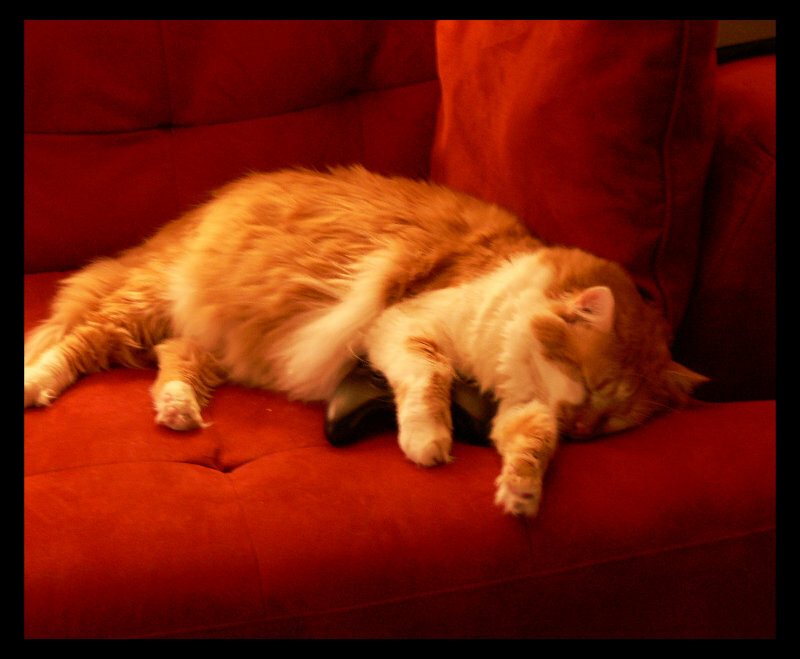 Life can be HARD. It can be because of illness, family issues, artistic angst -- anything. At the same time, when something amazing happens, many of us wait for the other shoe to drop, as if we don't deserve the largesse that fell in our laps. How we respond to both the pain and the joy can truly define who we are, not just to ourselves, but to other people. I recognize there are a lot of private people out there. Some of these are people who email me and tell me they're glad I wrote what I wrote because they didn't have the courage. There are also people who email me and tell me I'm full of crapola. And that's OK, too. Everyone is allowed to their opinion, and I'm not saying mine is the right one. But I like what I write, I like who I am, and I want to be real without fear of what people might think. 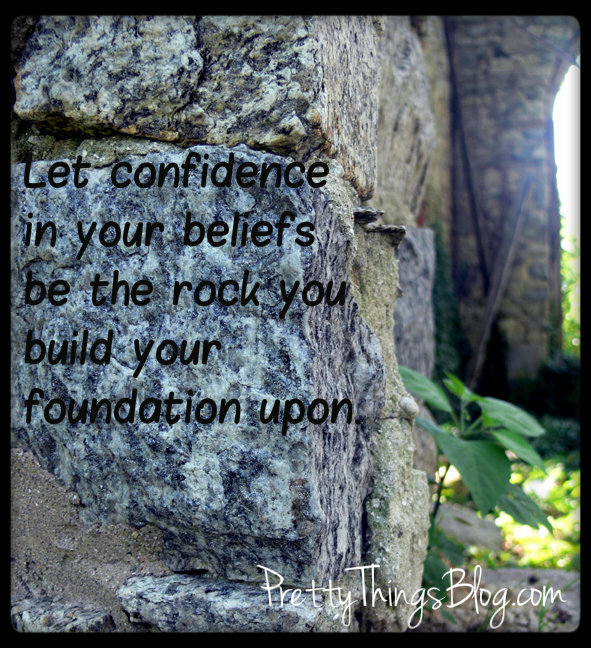 One thing I've been guilty of is not having confidence in who I am and what I'm working towards. I second-guess. I look around and think, "They're doing it better, I should give up." Or I worry about what people will think. The horror of one bad email among many that aren't can still crush me -- if I let it. Being afraid to be me -- that's not helping anyone -- you, or me. EVERYONE has worth. Everyone has the ability to reach deep inside and find that confidence. Will you? 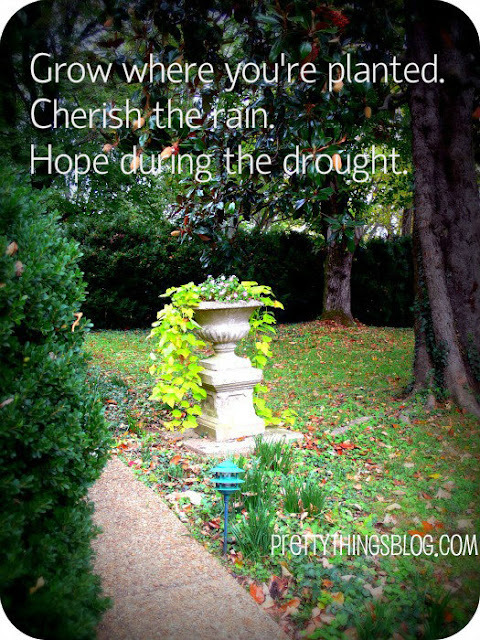 Will you find that one good thing in each day even in the midst of sadness, pain, or fear? And will you allow yourself to celebrate your triumphs, no matter what they are? 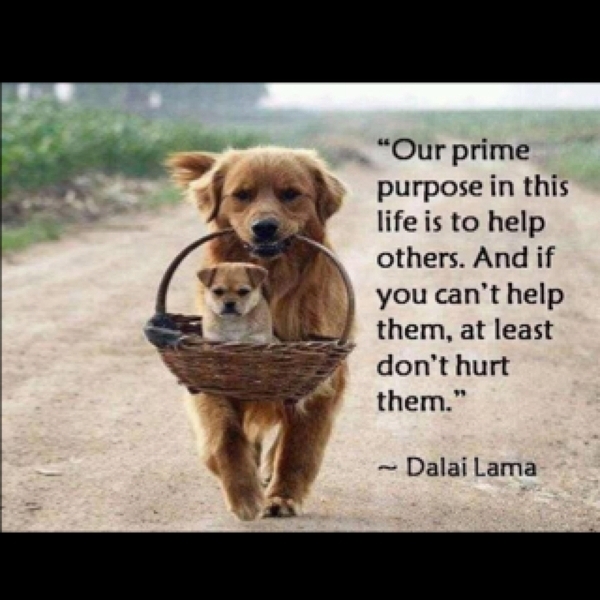 This is what I try -- try -- to do. I ache and hurt. I go to the gym anyway and feel energized. I have a migraine. I allow myself to go to bed because I no longer allow myself to feel I'm letting everyone, including myself, down. I see things around me that surpass what I'm trying to do, and while it's human nature to pout, it's better, ultimately, to cheer them on, because you never know what the future may bring. They could be in the grand-stand later, cheering you on as you parade down the road in pride. Life isn't perfect. I embrace this, because I learn from it. I've made some doozies of mistakes, mistakes that pain my heart and live with me for years. But at some point, if no one else will, you HAVE to forgive yourself. Apologize if need be, but don't forget to apologize to yourself. 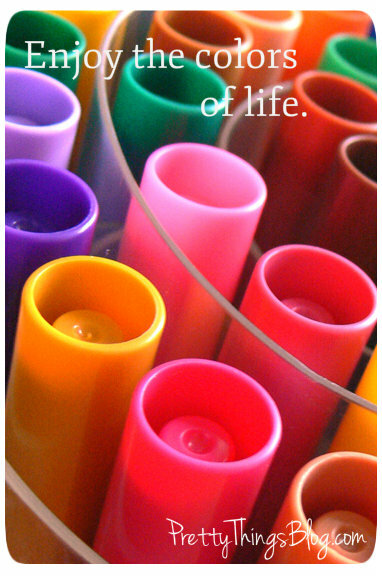 Life is meant to be lived and not mourned if at all possible. I'm not saying everything will be chipper chipper from now on -- that's impossible. 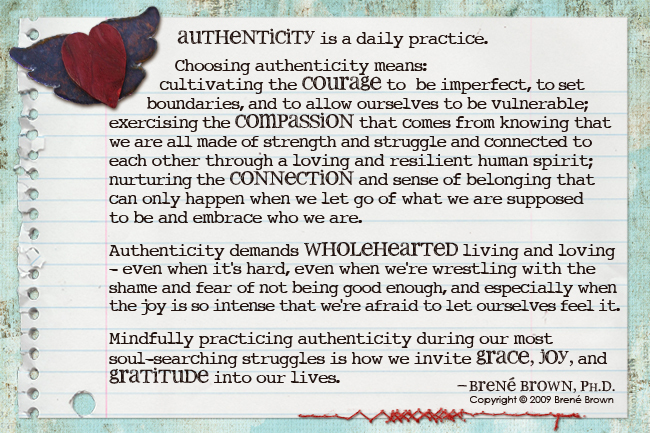 What I AM saying is authenticity is more important to me right now than much else. What you see is what you get, although I'm fairly awkward in public. I vow to write what I am feeling, with all the happiness and joy and heartache and foibles that entails. I don't want to be scared any more of being me. I'm not perfect. But I'm authentic. I'll be emailing you for your mailing address! 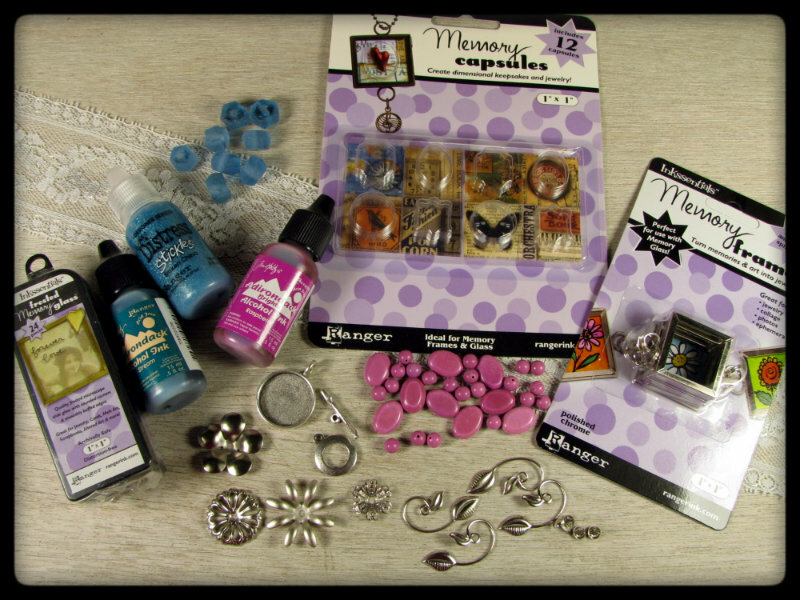 Stay tuned for a giveaway for AD/Adornments goodies! It's probably no surprise that most artists have completely chaotic work spaces. But out of chaos rises some of the most beautiful things in life! 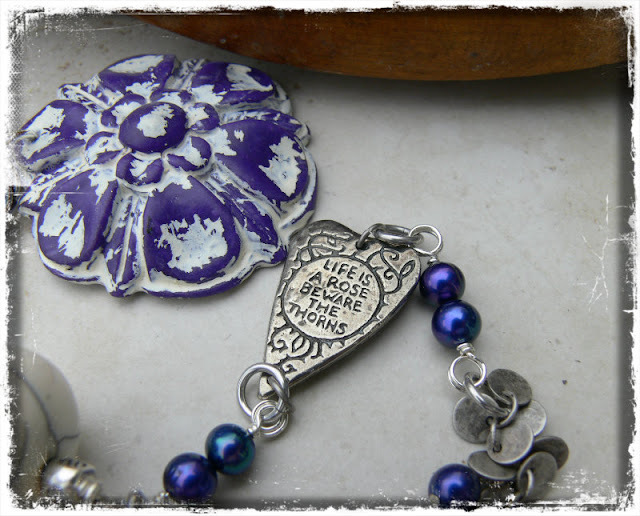 Brenda of B'Sue Boutiques created this blog hop to show the "dirty side" of the jewelry designer's life. Our pieces may be made with precision, but our table tops, that's another case entirely! So welcome to my little spot of chaotic heaven! First, an overall view. I moved my work recently to the library part of the living room (an addition we built a couple of years ago) because the lighting was much better than where I'd been working before. 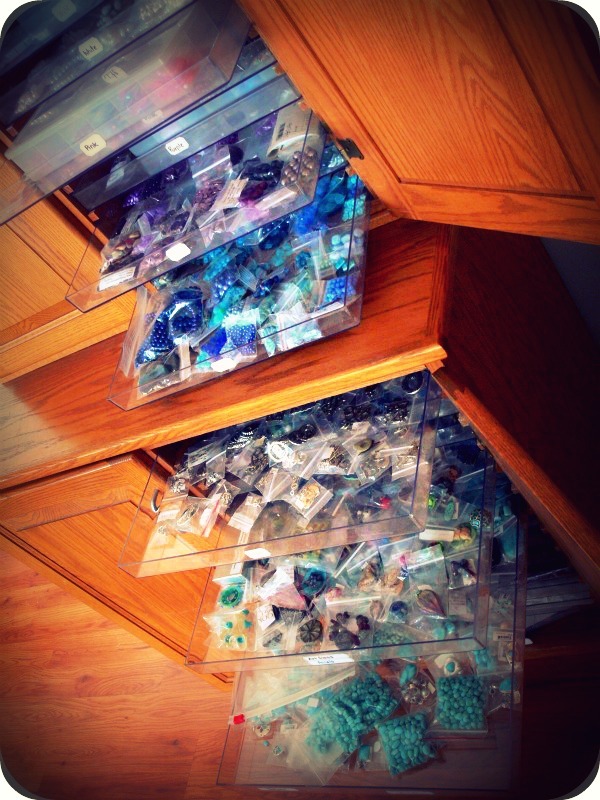 I have a storage cabinet for tons of beads, but it's on the other side of the room. When I used to work at the kitchen table, this cabinet was right behind me, but now I get a little exercise jumping up and down for this and that. Because I kept piling boxes upon boxes of beads onto the floor in order to avoid jumping up and down so much, I bought a dresser to store the beads I reach for all the time (sterling silver, wire, etc). I'm not 100% happy with it -- I really wanted something that was either flush to the top of my table or even able to be slid underneath it, but how often do you find furniture in the same color as your sofa and chairs? 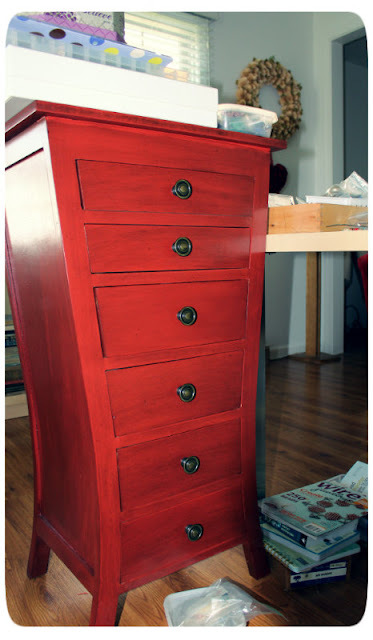 So if I end up changing my mind about this storage situation, the dresser will work elsewhere in the living room. As you can see, there's still stuff on the floor! Under the table, I have two metal bins to hold magazines and things like that, but I always seem to have something underfoot. 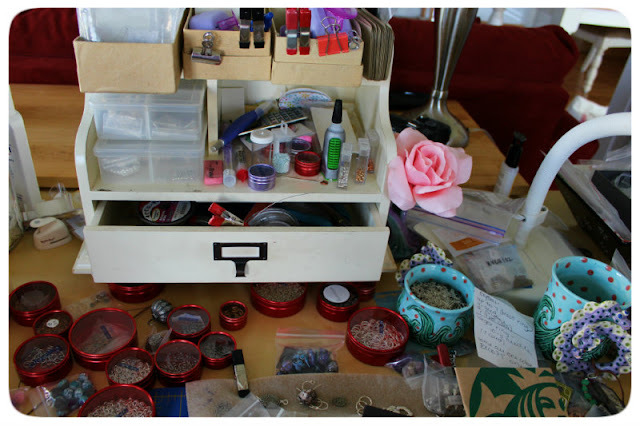 The top of the dresser holds yet more and more beads. I have a bad habit of going to grab one bag of beads and then seeing tons of others I have to work with RIGHT. NOW! So that pretty box (and a few others you can't see!) 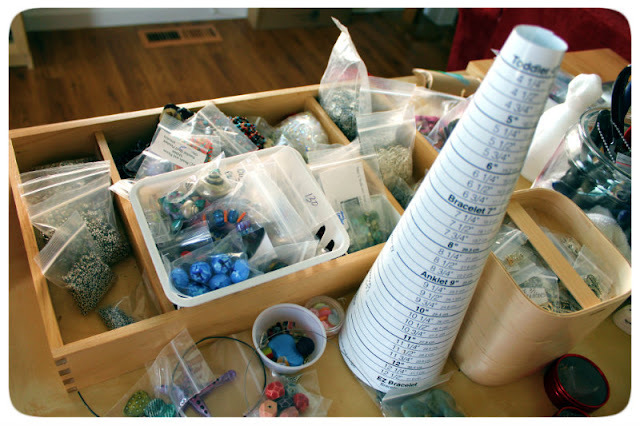 have lots of baggies of beads waiting to be played with. Sometimes this random assortment of beads helps me when I'm in a rut, because I can just reach in without looking and grab something and I'll make myself work with what I picked, no excuses! 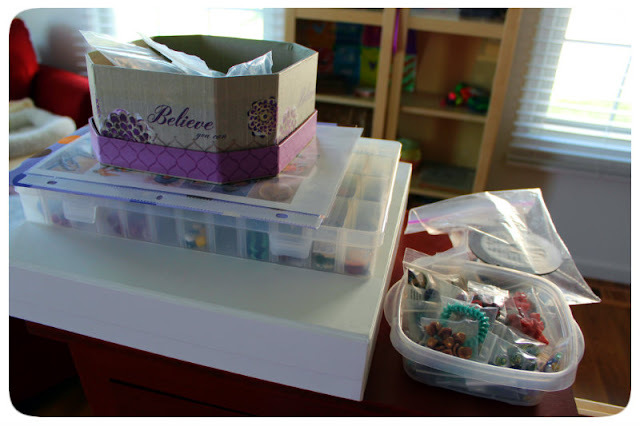 In the above photo, the large plastic box is full of earring pairs of all types. I like having that box ready and waiting so I don't have to go searching out doubles of this or that. The organizer is from either Marshalls or TJ Maxx and is supposed to be for stationery and what not, but it works beautifully as a tool caddy. 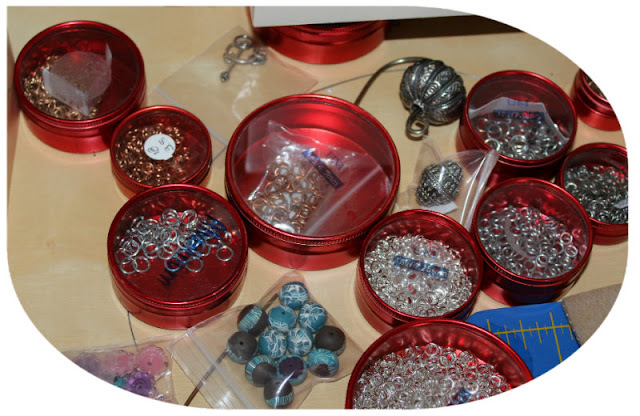 All of those little red tins are jump rings of various sizes and metals. The handmade cups are special to me, made by my friend Ayenne of Whimsee Pots. I have a ton of her stuff and I love having pretty things all over the place. One holds tiny snips of trash and the other holds silver scrap, waiting to be melted down. 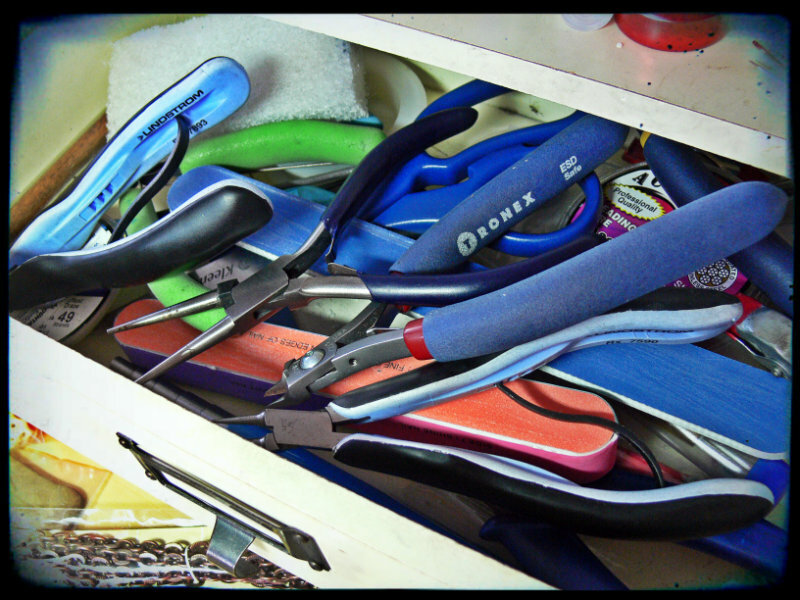 The drawer holds the tools I use the most. I have a cookie jar on the desk that Zack painted that holds less-often-used but nevertheless important hand tools. More mess. Organized rings, but a messy desk. To my left is another IKEA find, a wooden silverware caddy. This holds daisy spacers and ear wires that I use constantly, as well as beads that made a move from the pretty purple box above to a step JUST a little closer to actually being used. 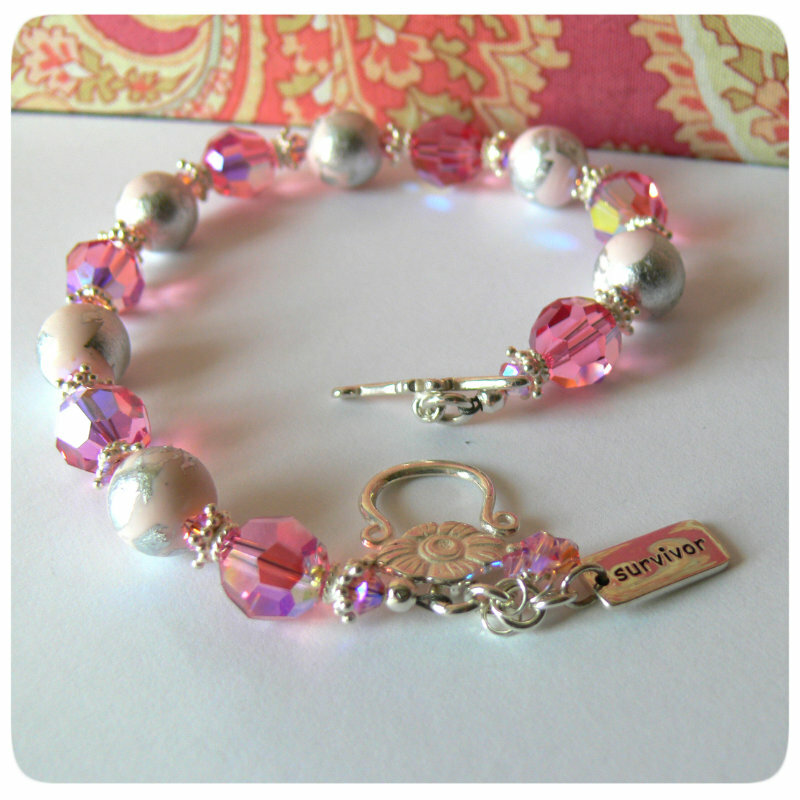 And I couldn't make a bracelet without a bracelet sizer! Measuring a bracelet linearly doesn't give you a correct measurement -- you need the inner circumference measurement, and that's what this cool invention does! To the right of the bracelet sizer is (again) an IKEA goodie. It's a three-tiered caddy from IKEA's bath section, and I put a selection of clasps in each tray ... sterling silver, pewter, and copper/brass. I have a larger drawer in the bead cabinet for toggles and clasps, but it's nice to have at least some right there at my fingertips. 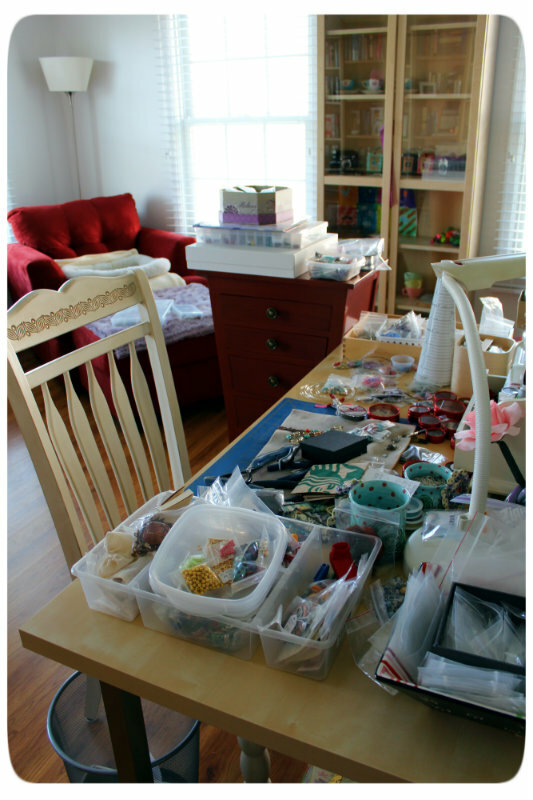 Of course, beading has a way of taking over a home. There are many days when work flows over into the living room. There you have it -- my mess. I love it. It works for me. I try to keep it neater than this, but as soon as I clean it up, it comes apart at the seams again. Beads are EVERYWHERE, it seems. But there's never a lack of anything pretty to look at in this house! Now it's time to visit the other messy studios! 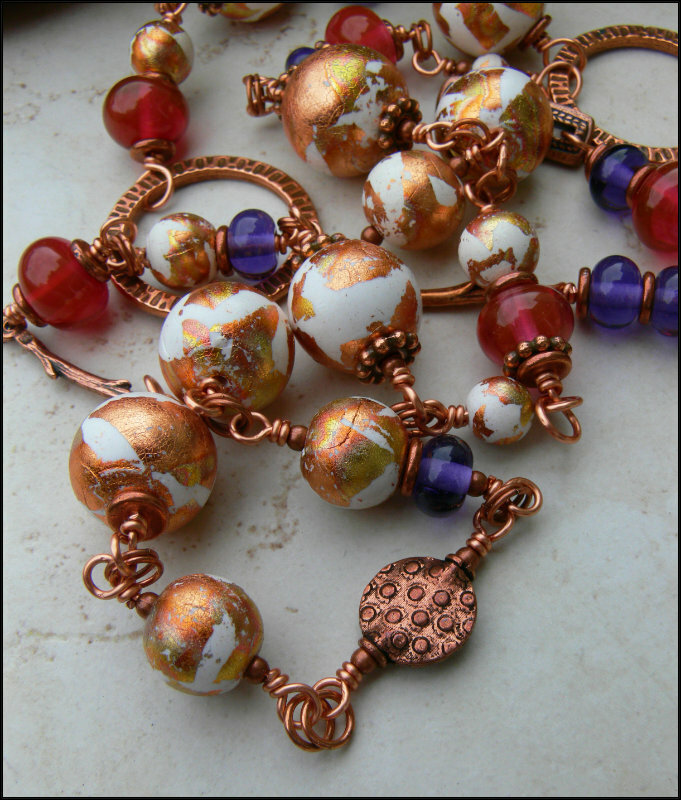 Jeannie Dukic has created the Echo Creative Club, a jewelry design challenge club where she sends out beads she made and we in turn make something and "send it out" on our blog (thus, the "echo"). 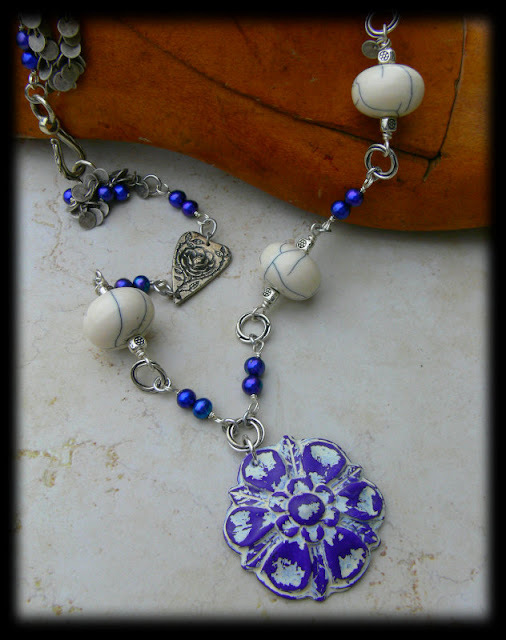 I was immediately challenged because other than pearls, I really haven't made a lot of jewelry in white. This was a GOOD thing, though, because if I'm not challenged, I'm not growing. I actually had a lot more of the white beads than are shown -- I've been hoarding various strands of her beads in anticipation of this blog hop. So with all those white beads, I knew I wanted to make a long necklace. 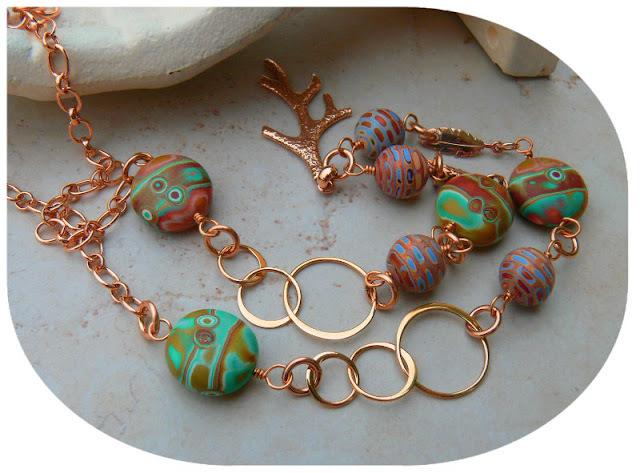 I used Jeannie's polymer clay beads in various sizes, copper-plated pewter, and some of my own lampwork beads. Next I used some very pale pink and silver polymer clay beads. I added a darker pink Swarovksi crystal, some bright silver bead caps, and a pretty toggle. I like to make my breast cancer awareness jewelry unique, and this fits the bill, so I added a "survivor" charm from Nina Designs and a cluster of crystal. And then some matching earrings. Next, I had more white beads, but this time with silver leaf. I decided to go for a vintage glam look. I love those tassels (wish they weren't so expensive!) and those vintage rhinestone beads from AD/Adornments are to die for. I think this one surprised me when it all came together! Next is a bit of a do-over. Jeannie sent me this bracelet, and I kept it almost exactly as it came to me. I wanted to make a pair of matching earrings, though, so I took out the polymer clay disks that were originally there (I'll use those in a later project) and replaced them with Tierracast floral rondelles. 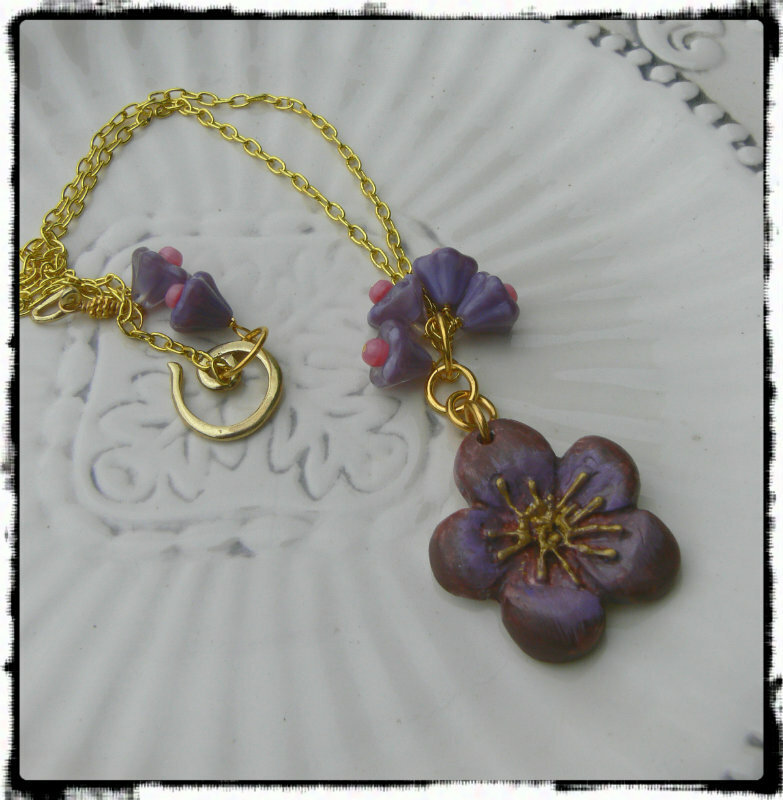 Now we come to a pretty cherry blossom pendant Jeannie made. I kept this one very simple, only adding some Czech glass flowers. Sometimes less is more. And finally, my favorite piece, made with Jeannie's gin blossom pendant. I used my favorite chain from AD/Adornments, blue cultured pearls, white Tibetan beads, and a Green Girl Studios floral heart connector. 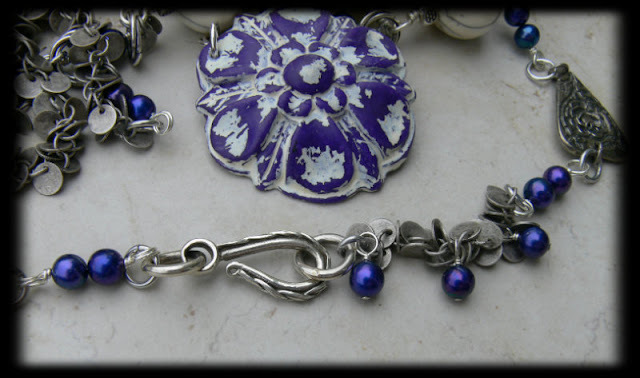 The clasp lies on the side of the neckline. To "fluff up" the chain on one side, I linked pearls into the chain. And there you go! All my creations with Jeannie's polymer clay beads. I hope you enjoyed the visit! Today's post is brought to you by total randomness. 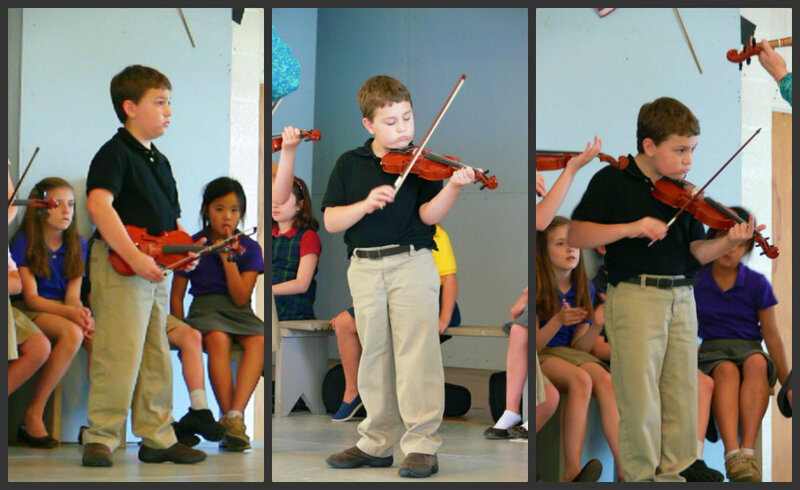 Zack had a violin recital yesterday. I'm so glad his school had someone come in for the past ten weeks to teach the kids. 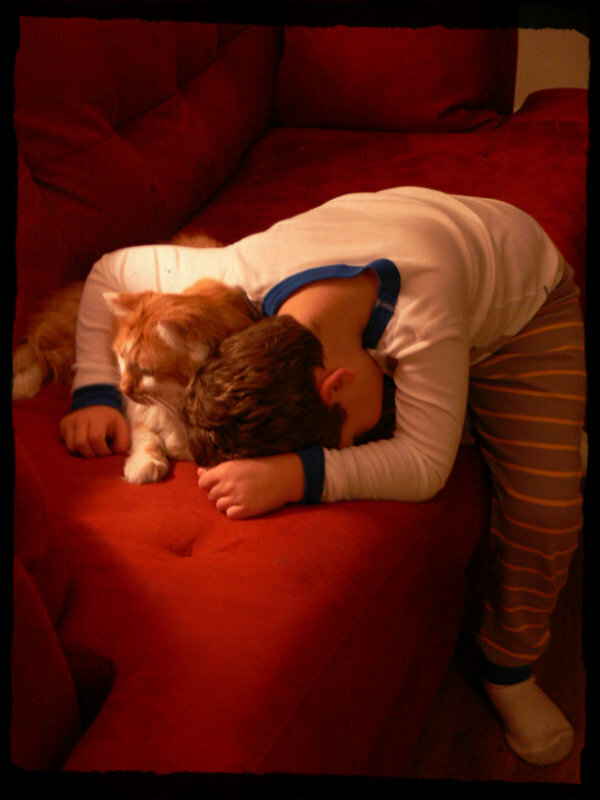 But this morning, Zack was not feeling good. Big Kitty had a sleep-in out of sympathy. 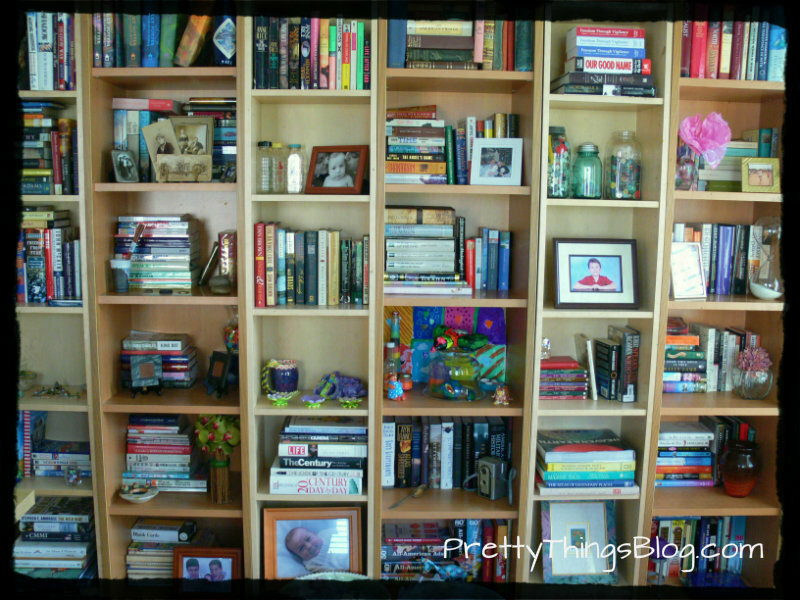 I finished organizing the book shelves. I decorated a bulletin board. 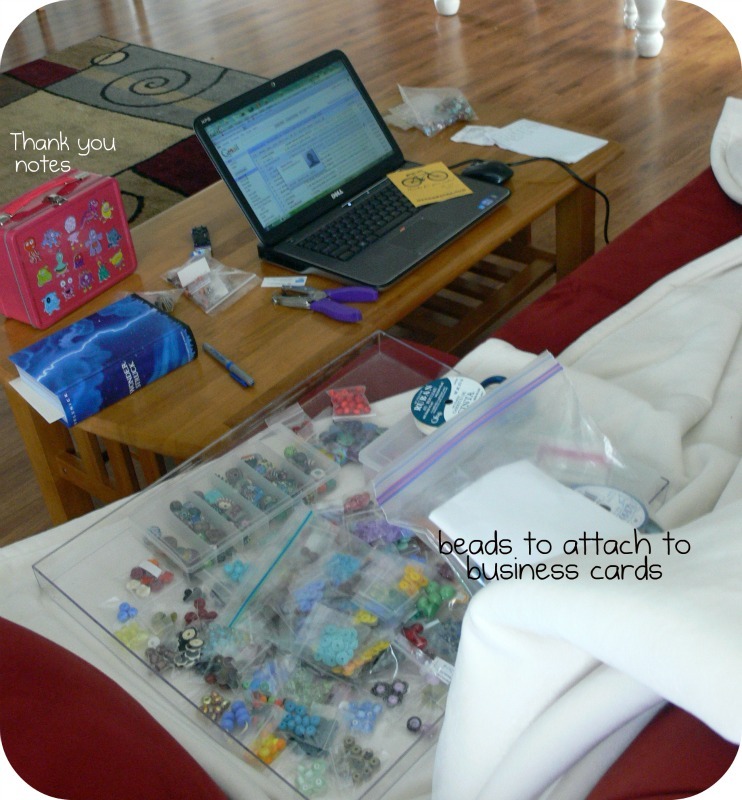 I love to keep postcards from art bead makers! I got my buttons for the Button Swap Hop from Niky. They all have a story which I'll be sharing on blog hop day. 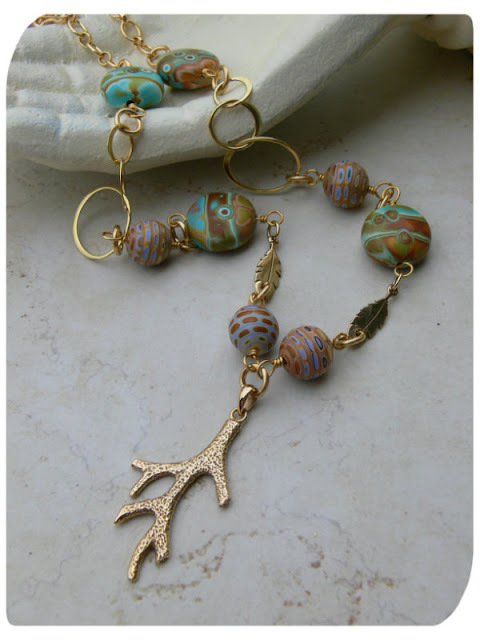 Tomorrow is the Echo Creative Club blog hop, and you can still enter to win beads from me and Nina Designs by clicking here. I'm wondering what I can make with these? They were my splurge at a recent bead show (they're made by American Trade Bead, who has a really interesting bead mission), I have the matching pendant, too. And I just learned his work is going to be in the Smithsonian soon! The Dalai Lama is very wise. 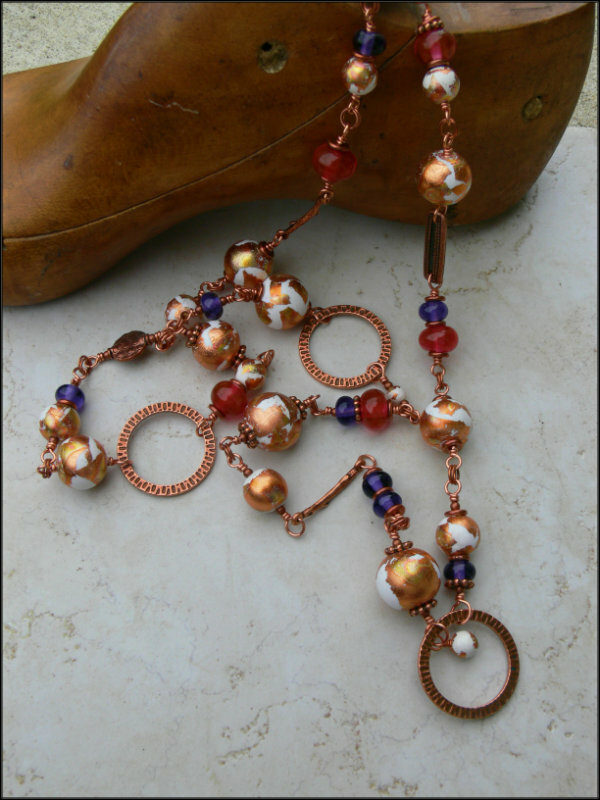 When I first started making jewelry about eight years ago, one of the first bead vendors I learned of was Nina Designs. I loved her philosophy and appreciated that she was "fair trade before there was a name for it". 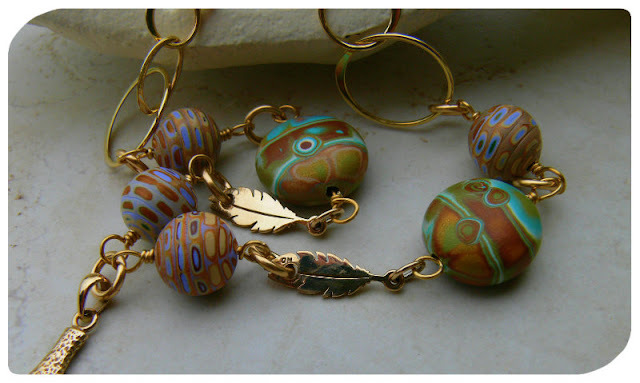 Her designs are unique and fresh and each bead or finding makes your piece extra-special. 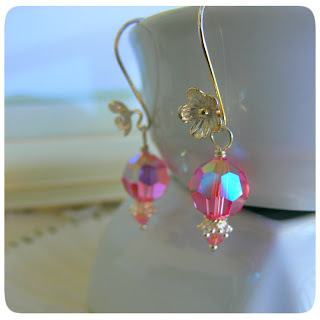 I was fortunate to be selected this month to participate in Nina Design's Blog Partner program. She sent me a selection of products to work with, and when they arrived, I was excited (and challenged!) because they were golden natural bronze. Absolutely stunning, and a challenge for me because I don't do a lot with gold metals. This necklace is a new favorite of mine. I used polymer clay beads by Alison Sachs and several pieces from Nina Designs -- the coral branch pendant, feather charms, and three-circle rings that I really think would make gorgeous earrings all by themselves, but I wanted to bump it up a notch and think outside the box. I wanted to use the feather charms as links, so I pulled out a metal punch and said a little prayer and punched a hole. Worked! 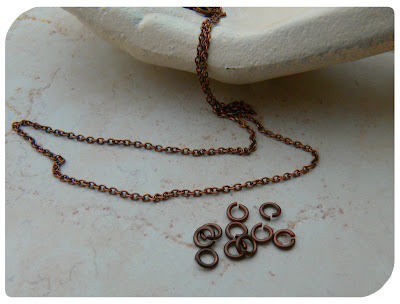 These pieces are natural bronze, but the polish and patina matched PERFECTLY with the gold-filled jump rings and chain I had on hand. That's some pretty bronze! 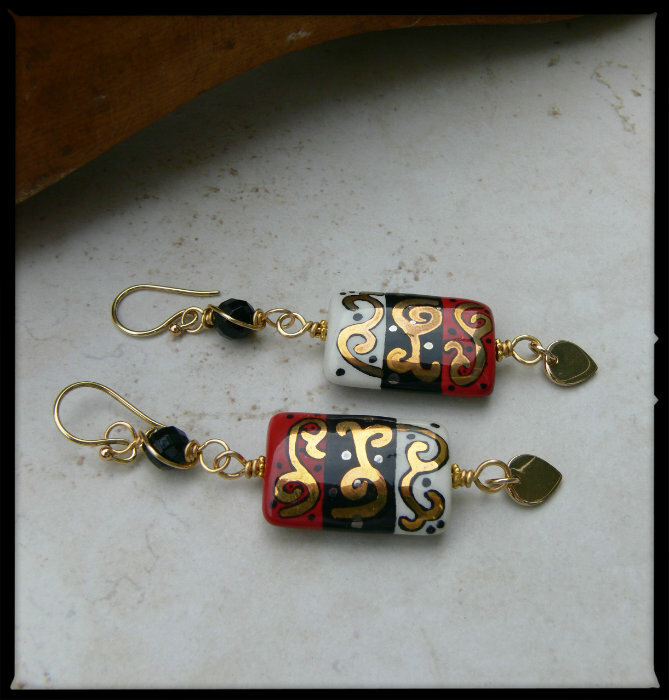 These earrings are made with onyx, ceramic, and Nina Designs lotus petal charms and ear wires. And oh ARGH, why is it I don't see mistakes until I photograph things? 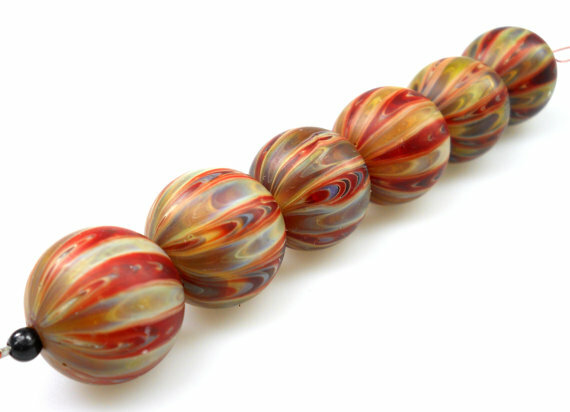 One ceramic bead is topsy-turvy. Sigh. Must fix that. These earrings are a bit different. They are a combination of industrial and elegant. I'm not sure how well they'll be received, but I thought they were unique. I took hardware store steel fittings and brushed them with a nail file to take off some of the black. 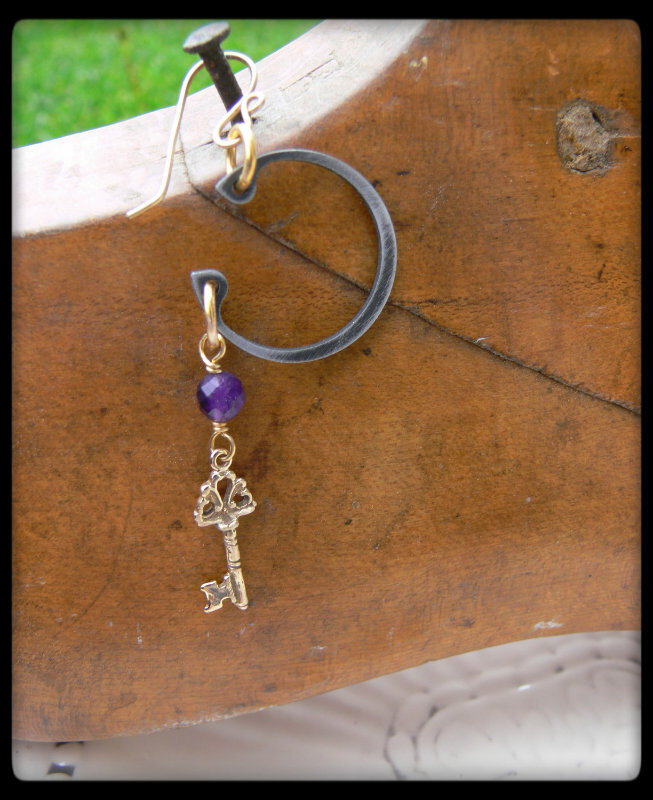 Then I wired amethyst to Nina Designs key charms. 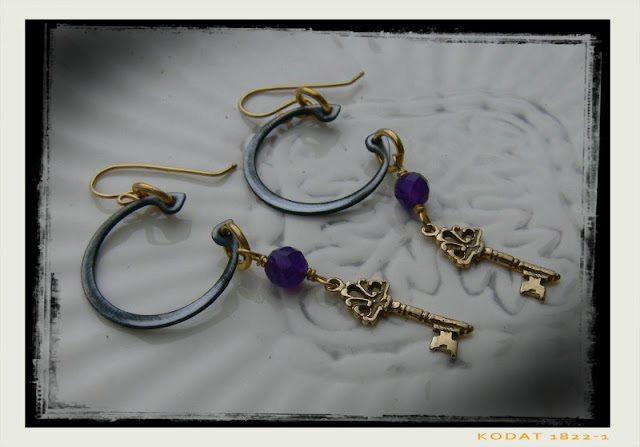 When worn, the keys face front and the hardware rings face like regular hoop earrings would. So what do you think? Is it a yes or a no? Now for the giveaway! Nina Designs sent a delicate 18" finished brass chain (complete with clasp) and matching jump rings. I'm adding a secret stash of beads to go along with them! 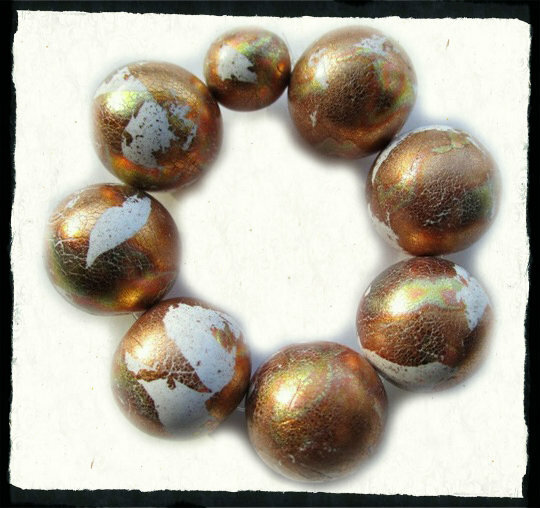 To win, leave a comment with your favorite Nina Designs bead or finding (click here for their web site). Feel free to blog, Facebook, or Tweet about the giveaway. The winner will be announced on Saturday, April 28th. 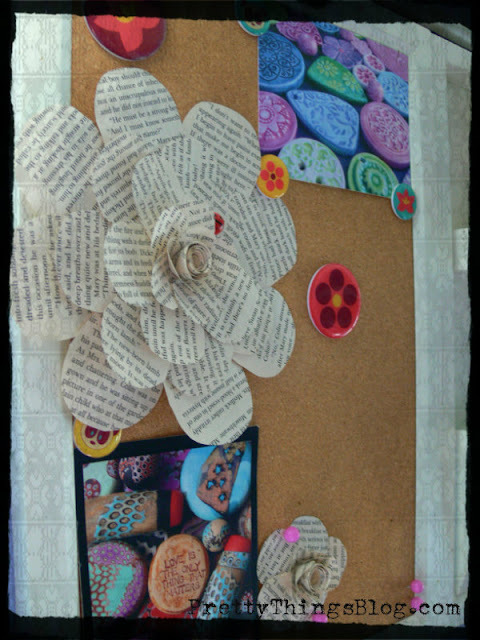 The materials above were provided as part of the Nina Designs blogging program. The author of this blog has not received any payment from above-mentioned company. The post above represents only personal opinion of the blog author.